After telling Healthcare.gov who is in my household and which people I want to insure, it asks me if I want to add the people I already entered into the system. Add these people to what? It tells me that I am not applying for insurance for a person and then asks "Is this information correct?" The information is correct. 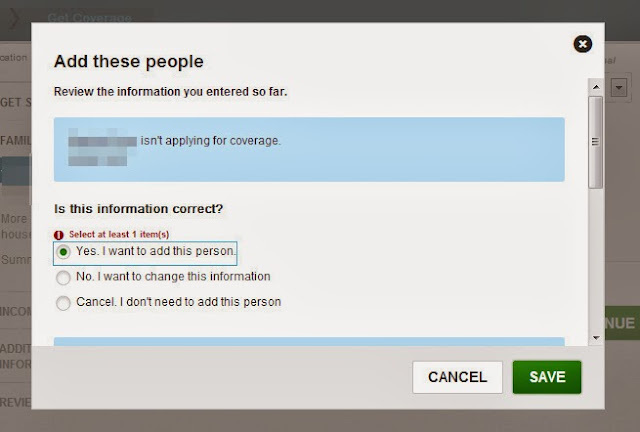 I do not want to apply for coverage for the person listed. The "Yes" option adds "I want to add this person". The "No" option adds "I want to change this information." I have already added this person to the application as a household member who does not need insurance. How should I answer this question? Is it asking if the information I've already provided is correct or is it asking if I want to add this person as one seeking insurance? Does answering "Yes" add them to the application as one I want to insure as the provided answer suggest? Or does answering "Yes" mean that the information I previously provided -- that they are not applying for insurance -- is correct? Then, what does the "Cancel. I don't need to add this person" option do? I like how it also presents you with a radio button selector but tells you to select at least 1. I'd like to know how to do that.